We’d love your help. 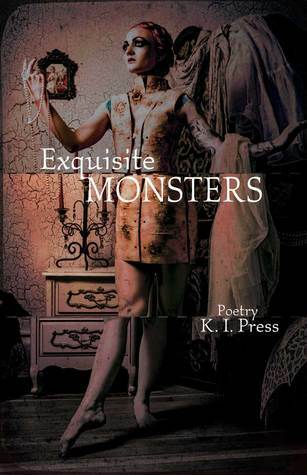 Let us know what’s wrong with this preview of Exquisite Monsters by K.I. Press. With vicious wit, K. I. Press pries open the intimacies of our lives in her collection of poetry, Exquisite Monsters. Fearless and weird, she splays open motherhood and mourning, laying them cheek by jowl next to biomechanical androids, and explosions of pop culture myths. And with every copy of Exquisite Monsters, enjoy your very own phantasmagorical, gender defying, recon With vicious wit, K. I. Press pries open the intimacies of our lives in her collection of poetry, Exquisite Monsters. Fearless and weird, she splays open motherhood and mourning, laying them cheek by jowl next to biomechanical androids, and explosions of pop culture myths. To ask other readers questions about Exquisite Monsters, please sign up. I received this book free from a goodreads giveaway. The poetry was weird, dark, quirky and mostly fun to read. I really liked the monster part at the end. Loved this collection. "Fearless and weird," indeed. K.I. Press is a Canadian writer who grew up in northern Alberta and now lives in Winnipeg, with stops along the way in Edmonton, Ottawa, Vancouver and Toronto.